Few people can say they have experienced as much of the world as Louise Lough and her family – but they haven’t had to travel thousands of miles to do it. Lough has hosted more than 100 exchange students since 1979, from countries across nearly every continent on the globe. She started with a student from Rio de Janeiro, Brazil, and most recently hosted an African student from Kenya. The family has lived in Nampa since 2005. For 35 of the 37 years she has hosted students, Lough has used Ayusa International as her host organization, from the time it was founded. Ayusa is a nonprofit student exchange organization and an official U.S. Department of State designated Exchange Visitor Program Sponsor. Lough’s love for other cultures started when she was in high school. An exchange student from Seoul, Korea, came to her school, and the two became close friends. “It’s just kind of gave me a real love for other nationalities and other cultures,” she said. Later on, Lough still had a passion for experiencing other cultures, but she didn’t have a lot of money for the airfare and lodging. 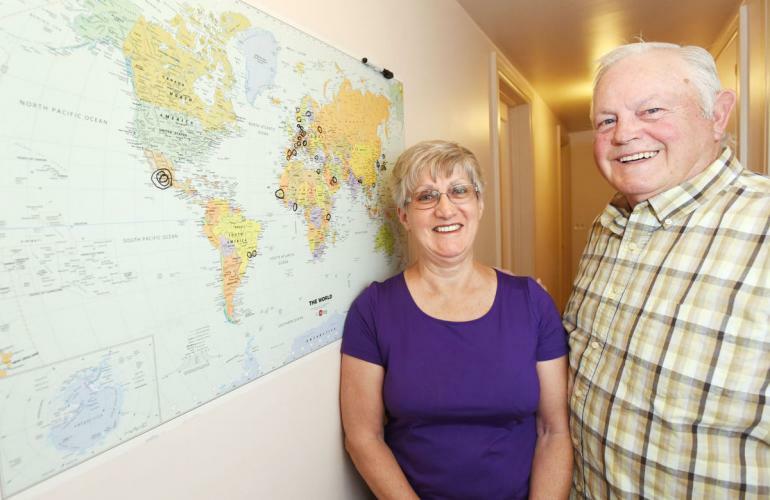 “I thought, ‘Well, It’ll never be able to travel the world, my biggest goal is just going to be to see the U.S.,’ so I just thought we would start hosting exchange students so we could experience the world through the eyes of others,” she said. Since then, the exchange bug has spread through her family, to her parents and children. At one point, Lough said all three generations were hosting students at once. All of the students are between the ages of 15 and 18. Lough’s son Travis Johnson, 48, was no longer living with Lough by the time she started hosting students, but she was the catalyst for his family beginning to host about four years ago at their home in Colorado. Johnson took in a student Lough knew who was struggling, and he ended up settling in and doing well at their home. Johnson and his family have also collaborated with neighbors across the street who hosted two students one year while they hosted one. The three became friends. Johnson and his family have also traveled to Ireland and met up with former students. He encourages families to try it out and not to fear incompatibility issues. Lough’s Kenyan student, Salim, is Muslim. Recent terrorist attacks have been followed by anti-Muslim sentiment among some Americans. Lough said he went to church with them every Sunday and helped greet people at the door, and completed more than 300 hours of community service. “Everybody should at least once try to host an exchange student just too open their eyes to what it might be like in another part of the world, especially the Muslim part of the world,” she said. “I think we have a lot of misperceptions. For the most part, most Muslims are very peaceful people, they love people just like you and I do. The families of students the Loughs have hosted also returned the favor by inviting them to visit their home countries. The Loughs have been to Denmark, Norway, Austria, Germany, Spain and Switzerland, and recently traveled to San Francisco with the Danish family. Ayusa works with families of all types who are interested in hosting, including those with or without children, military families, retirees and single people. Students can be placed in any population as well, whether rural, suburban or urban. Lough hopes her experiences will persuade people to give it a try, because it has opened her perspective on the world.